Thank you to all who commented on the post for the Bewitching Home goes Pink. I always appreciate your thoughts. The winner of the mask is Maddyrose of Santa and the Mrs. The Winner of the pink witch hat is Wendy S of The Year with Cats. Congratulations to both of you. I'll have these in the mail to you on Monday. And now on to my guilty pleasure. I have for most all of my life been fascinated by all thinks "dotty". Red and White polka dots just do me in. Love, love, love them. And so, that love has brought me to an insane love of gnomes, mushrooms and all manner of wonders in the required white on red dotty world. I have a folder on my pinterest "What is red white and gnome all over" and fill it with my heart's desire often. I found that there is another person that I know who shares my passion for polka dots of the red and white variety and I came to know this when I saw some of her photos in her blog, The Vintage Fairytales. Yes Becky is a dotty nut in addition to being a fabulous photographer and lovely person. 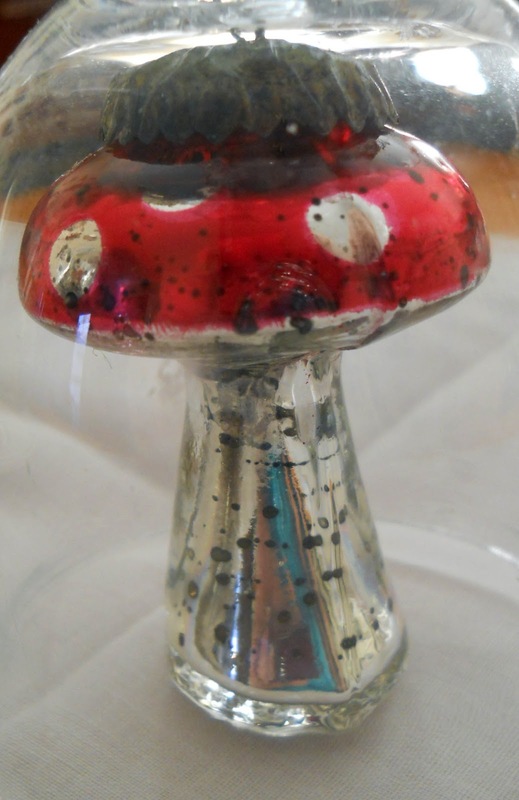 She sent me this too fabulous for words antique glass red and white topped mushroom because.....just because. I adore it and Becky. I have installed it into a bell jar to keep it safe......I'm not sure that's where it will stay, but after all the Halloweenie comes down, I'm looking forward to placing it in its permanent home in the dining room. Or as my grandchildren like to say.....the display room. Thank you SO much, Linda, I"m so excited! And I love polka dots too esp. little toadstools. What an enchanting way to display yours in the bell jar. Congrats to the lucky winners! Red and white polka dots, eh? Black and white polka dots evoke a memory for me -- when I was a kid out in the rural Canadian prairies, the Hutterite women always word black and white polka dot kerchiefs on their heads. Thanks so very much for helping to make my day complete. 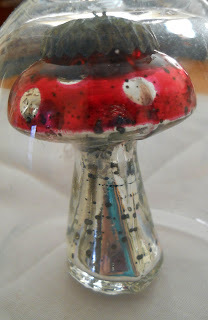 I'm eluding to my win of course and then for the look at the fantastic mushroom of the red with white polka dot variety. Isn't it just too wonderful?? Hi Linda. I, too, love white on red polka dots! Love that antique mushroom.